On Nov. 4, ISR Director Reza Ghodssi (ECE/ISR) was an invited speaker at the IEEE Sensors 2013 in Baltimore, Maryland. Ghodssi spoke on Microsystems for Sensing and Characterization of Bacterial Biofilms.” Bacterial biofilms cause severe infections in clinical fields and contamination problems in environmental facilities due to the complex bacterial composition and extracellular matrix of biofilms. He discussed the fundamental mechanisms of biofilm formation, and explained that non-invasive characterization is desirable. 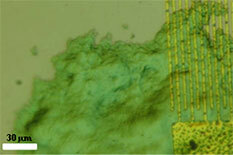 Biofilm sensing at an early stage of growth is critical for managing associated problems, such as infectious diseases. He demonstrated the significant advantages of using microscale devices for the investigation of biofilms, including low volume requirements, high throughput, sensitive detection, and real time monitoring. He also summarized microfluidic-based biofilm characterization platforms as well as a microscale sensor for early detection of biofilms using a surface acoustic wave. The IEEE SENSORS Conference is a forum for presentation, discussion, and exchange of state-of-the art information including the latest research and development in sensors and their related fields. It brings together researchers, developers, and practitioners from diverse fields including international scientists and engineers from academia, research institutes, and companies to present and discuss the latest results in the general field of sensors.